Ok, it's your 40th Birthday and the favorite phrase is "Over the Hill". Let us help you over the hill with a fabulous send off over that hill with our party themes and party decoration supplies. It will be a party to remember. Our Vintage Dude 40 Ultimate Party Pack features eight place settings along with fun party decorations and a personalized vinyl banner The Vintage Dude 40 Ultimate Birthday Party Pack includes serving for 8 guests and party supplies such as balloons and banner. Our Best Day Ever 40 Ultimate Party Pack features trendy arrow and triangle patterns in black and gray along with your accent color choice This party pack will come with eight place settings. Our 40th Birthday Table Cover features the number 40 in a multitude of colors. This plastic 40th birthday table cover is 54" x 108". With a sea of green, gold, red, purple, and orange numbers, this 40th birthday table cover is sure to please at any fabulous forty party! Perfect for a 40th or 50th birthday gifts, this ?Older than Dirt? 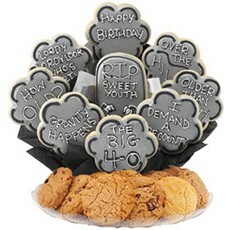 cookie bouquet, decorated in gray, black, and white icing, sends fun messages such as ?Gravity Happens? and ?I Demand a Recount. ?- This item is priced as a 9 cookie. Wow! How many candles is that? 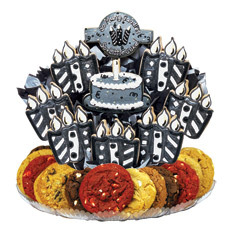 Send your birthday wishes with this humorous cookie boutray. This item is priced as a 9 cookie.